West Loch Fairways Association is a community association and non-profit corporation in the State of Hawaii. The Association is made up of 720 single family residences with the owners of the fee simple properties having membership in the West Loch Fairways Association. The Community is situated on about 100 acres on the Ewa plain at Honouliuli, District of Ewa, City and County of Honolulu. The subdivision is bounded by Fort Weaver Road to the west with West Loch Golf Couse to the north and northeast. Asing Park makes up the southern border of the community separated by an old agricultural road that is still in use today. To the east and southeast lies the old Oahu Railway and Land Company easement a forty foot wide strip that is currently designated as a bike path which connects Asing Park to West Loch Shoreline Park with plans to someday be incorporated into the greater Leeward Bikeway. Beyond the bike path, directly east of the subdivision, is the Honouliuli National Wildlife Refuge. The neighborhood boasts almost 15 acres of green space, including two mini parks and approximately 1000 mature trees. The Association is responsible for maintaining all the green spaces, including an extensive irrigation system, a water feature and more than 400 trees. The Association also maintains more than 2 miles of service roads, 1 mile of sidewalks, almost two miles of moss rock walls, 90 antique style walkway lights and a fiber optic close-circuit camera system. West Loch Fairways was originally one element of a master-planned residential community developed by the now defunct City and County of Honolulu Department of Housing and Community Development. The project, conceived around 1987, included two phases. Phase 1 involved the development of the 600 fee simple residential units at West Loch Estates. Phase 2 included 720 fee simple residential units of West Loch Fairways and 150 rental residential units of West Loch Elderly Village. Sixty percent of the housing was priced for what the City termed “the gap group housing market”. This group of home buyer had a family income too high to qualify for government assisted rental housing, but too low to qualify for conventional financing of market priced homes. The “gap group family income” fell in the range between 81% – 120% of Oahu’s median family income at that time. The remaining 40 % of the housing sold at market prices. 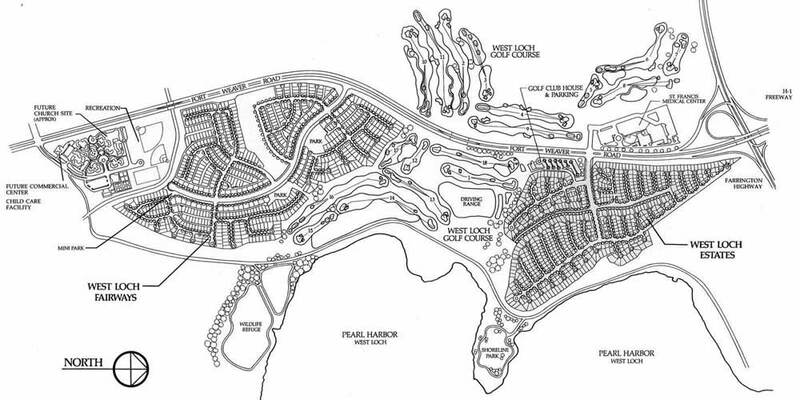 The full scope of the entire master-planned residential community also included the 197 acre 18 hole municipal West Loch Golf Couse, the 39 acre linear West Loch Shoreline Park and path and the 17 acre Asing Park developed by the City and County of Honolulu, Department of Parks and recreation. West Loch Fairways Townhomes is a 136 unit fee simple condominium and was developed and built in 1992 as affordable housing by West Beach Estates. It is situated on a 10 acre site in the center of the West Loch Fairways Association under an agreement with the City and County of Honolulu.